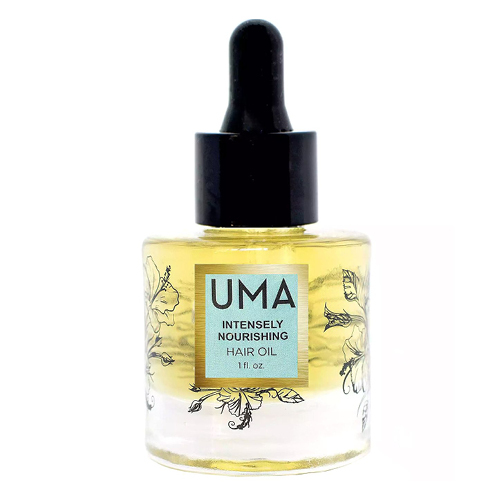 The Intensely Nourishing Hair Oil by UMA Oils is a lightweight hair oil that delivers a feeling of essential moisture and restoration deep into the hair follicle. Extracts of powerful botanicals lend a clarifying and strengthened feeling to hair from root to end. This non-greasy oil leaves no feeling of residue, and is perfect for all hair types – even color treated hair. A few drops go a long way with this organic botanical oil for hair. Powerful and non-greasy, it lends an appearance of rejuvenation to your hair for a smooth looking mane. Apply 5-6 drops to roots, scalp and hair as a pre-shampoo or overnight to give hair a strong, healthy look. Use 3-4 drops on damp hair before a heat treatment for an appearance of brilliant shine. When applying to dry hair, use 2-3 drops on lengths and ends for an all day look of smooth, lustrous hair. Smells great and works great! A single bottle could easily last you 6 months when using daily. I have thick long hair and do not need to use a lot of product.